DESCRIPTION: Mindfulness is a way of life, an inner resource available to all that improves mental balance, increases our ability to focus and be attentive and cultivate emotional resilience. When you begin to practice mindfulness almost immediately you become aware of a new spaciousness inside yourself, a calmness and stillness- you give your mind a rest from incessant thinking and reacting. This Quick Introduction gives you the initial guidance and core exercises that is fundamental to start practising mindfulness. NOTE: We will never spam you or give your email address away. 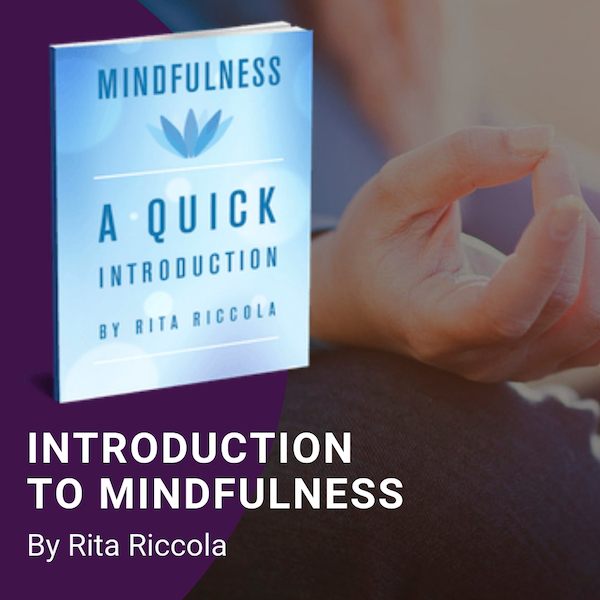 The Author, Rita Riccola is one of New Zealand’s leading mindfulness trainers. Hundreds of teachers, life coaches and counsellors in both New Zealand and Australia has taken her 2 day mindfulness facilitation course to date. She have provided staff training for numerous schools across New Zealand in order to help them integrating mindfulness practice to the curriculum. She is a former teacher and a trained mindfulness teacher with 28 yrs experience who has completed courses with Mindful Schools USA and attended many Mindfulness retreats. These courses are designed to meet the growing need for educators and human resource workers to offer Mindfulness training to all.